I like to see them coming back to life. 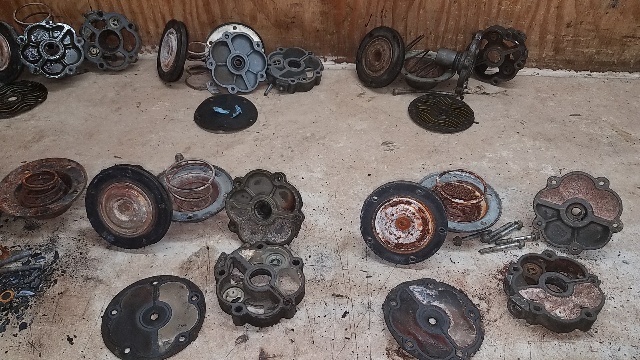 This afternoon I plan on testing the 50 year old fuel pumps I have. I hope to find one good one that can pump fuel for engine testing. If not, I have an electric pump I can tie in to the battery with a fuse and switch. > fuel pumps I have. Kenzen: I never got to them today. I will take your advice when I get to work with them. I did get to change the oil filter and install the 12 plate cooler. Installed the aft close out panel before installing cooler. Installed rh aft close out panel also.. Installed both forward heater closeout panels. I tested the low oil pressure switch and it checked good. Reinstalled switch. Also installed the idler pulley. Cleaned all the 3/8×16 holes with a tap. They all were difficult to get a bolt to go more than a thread an 1/2. Now I need to make some block off plates for the heater panels to close off those big holes. Respect! Awesome to take this on. We'd all love a video of start up please run or no run. Fingers crossed! Matt: I just want to keep all that fan air going straight down instead of exiting at the first spot. Edited 1 time(s). Last edit at 04/12/2018 08:44PM by Lane66m. So very much enjoying this thread. More work done on ol'110. Had to remove RH head to replace #5 exhaust tube. Found upper left head nut loosen #5 also. Unfortunately 2 heads studs broke down at the block. Now we have to work that issue. We have several others that have thinned to the point of needing replacement. All top bolts need the replacement. 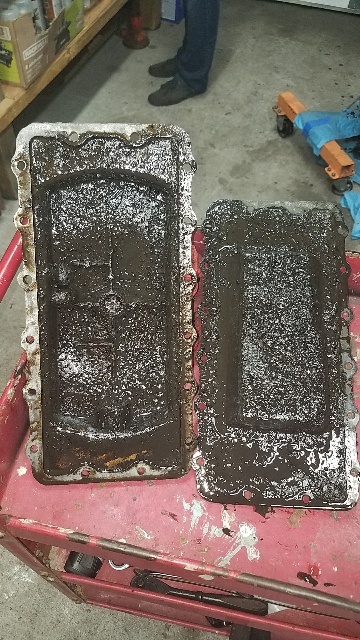 They all came out without issue. 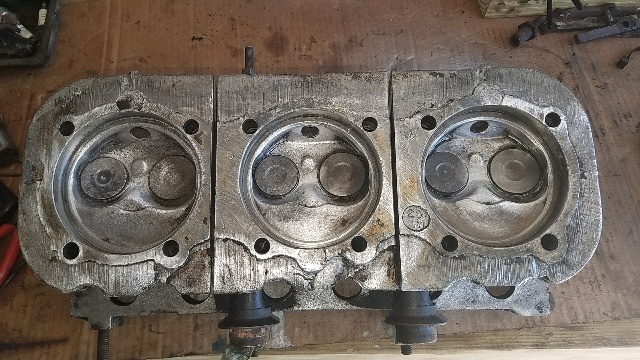 Enjoy the photos of the RH head and pistons. We will wire brush them to clean them up. Also will check heads for seepage. We will replace piston rings, cylinder gaskets and head gaskets while we are here. 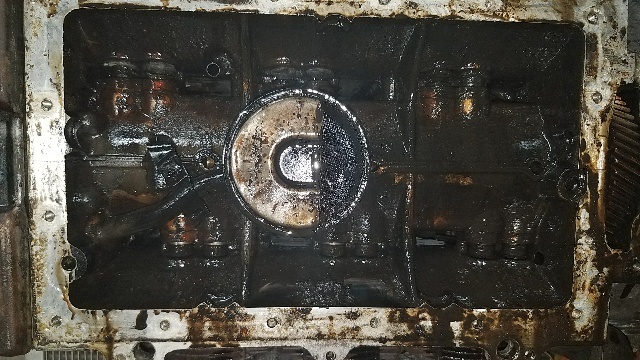 No play noted with the piston rods. 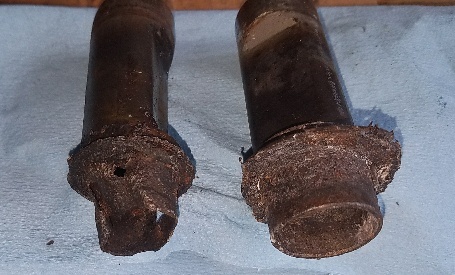 We will now remove LH head so we can remove #6 exhaust tube which is severely corroded also. I hope we have better luck there. Then I will know what I might need in my Clark's next order. 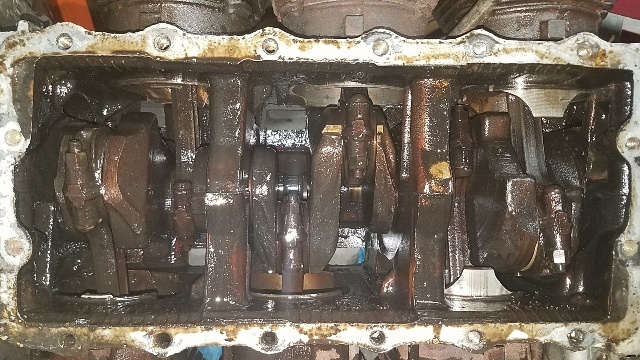 Guess I will have to open up the crankcase to replace a piston. 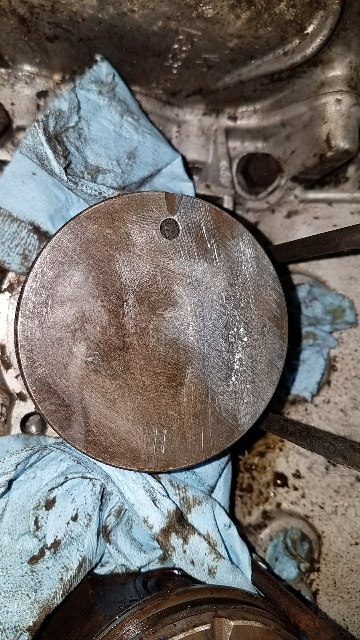 #5 has severe corrosion on the top of the piston. 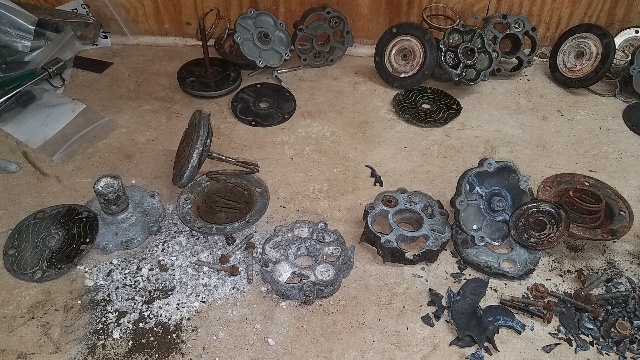 I have some nice pistons that can be used to replace it. on old cars. It is called "the might as well disease". Yes, I know. If it wasn't for the #5 exhaust tube having to be replaced and the bolt obstructing it breaking, who knows. I might have left the head on, changed the tube and went on oblivious to the weakened piston. I was going to try to get the bolt out obstructing the removal of the #6 exhaust tube, but what the heck. Do one side, might as well do the other to see if corrosion has also damage that side also. Clean up the head chambers on both heads and be good for awhile. Head looks like it will clean up nice. will know tomorrow. Anyway. I forgot. I did a major task. I deflashed both heads from the top and bottom as there were no exhaust heat shields to be in the way. This one of the days tasks along with removing push rod tubes to install heat shields, replace rusted out exhausted tubes and reseal the push rod tubes. Well one out of 4 ain't bad. We'll get the LH head off tomorrow and clean up both head chambers. We will leak check the seats also. The LH pistons will be wire brushed and inspected for serviceability. A highlight of the day was when I noticed the outboard tip of the #1 intake push rod was missing. It was brittle and little pieces could be flicked off using my fingernail. I was able to pull the one bolt inhibiting the removal of the #6 exhaust tube. We have got the rusted tube out. 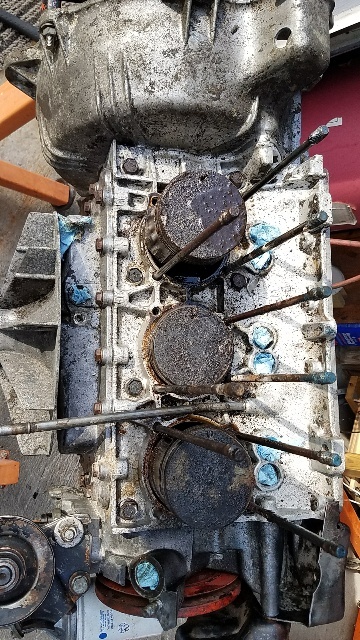 I put a borescope in the cylinders but the Marvel Mystery Oil makes it hard to see the piston tops. I will flip engine on the stand, so the head is on the bottom. Then a good rinse out of each cylinder with mineral spirits will be done. We will take another look before I decide to pull the head. I got all the LH heads push rod tubes removed. 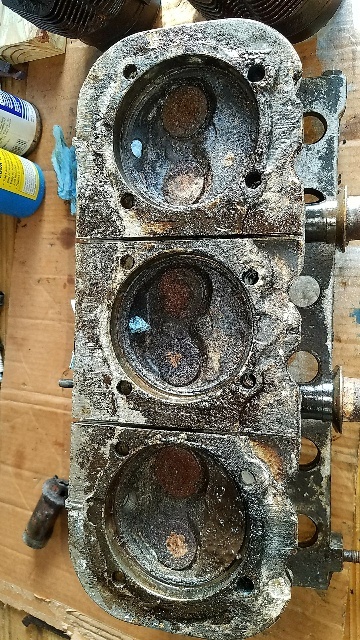 Rotated the engine to LH head spark plug ports down and sprayed mineral sprits into each cylinder until clear fluid came out. Air dried each cylinder, then rotated the engine back up for the borescope inspection. Inspection revealed each cylinder had carbon on the tops of the pistons. Rick and I will discuss the engine on Tuesday over the engine and coffee. I suspect we will change the #5 piston and all rings on that side. Cylinder and Head gaskets will changed also. I have them here in the garage stock. Just need to order the rings. LH head will stay in place from what I see. As a side note, all push rod tubes will be replaced due to excessive rust. Some look like they are almost rusted through. I pulled the top cover in preparation to replace the #5 piston. 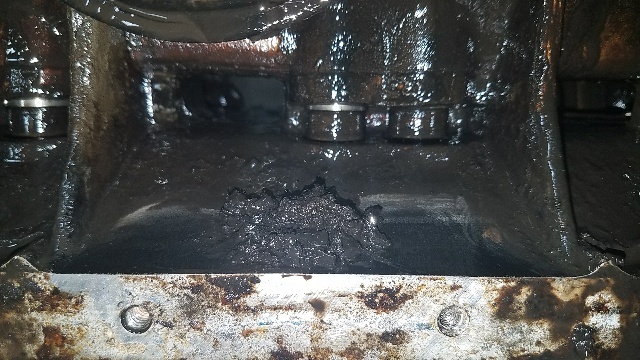 During the removal the fan refused to budge off the bearing. Sprayed PB Blaster on it and waited10 minutes. No go. It still would shift up or rotate. 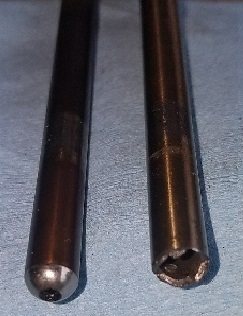 A small application of heat resolved the issue. I pulled up slightly on the edge of the fan while heat was applied and about 10 seconds in, the fan came right off. After we got the cover bolts out we got a big Surprise Surprise. This engine run on 10W-30 mud. I am glad we did not run this engine now. 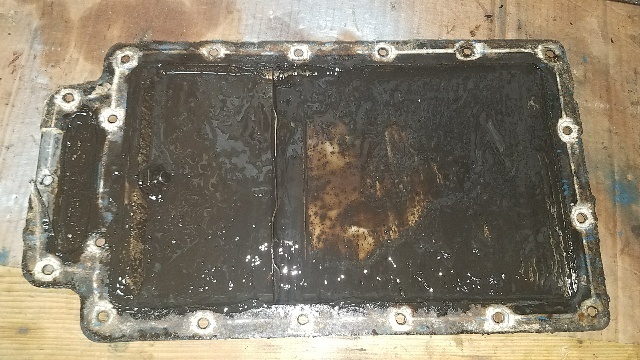 We then decided to remove the oil pan. Here are its photos. The close up is the pile of junk scooped out of the pick up. Getting ready for Helen so not much has been done today. Clean up chambers of RH head is about it. Head is good to put back on. 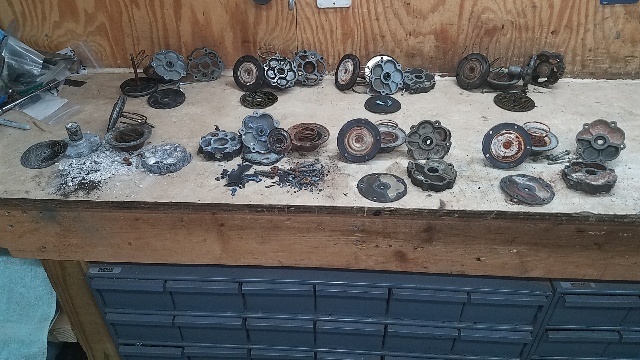 I did get to take apart all the mechanical fuel pumps I have as suggested by Kenzen. Good suggestion. None were worth using. All going to the trash. Nothing worth salvaging. Too much rust or corrosion on everything. I will set up a simplified electric fuel pump system to use for the test. Going to set up warning lights for the low oil pressure switch and overheat switch just to monitor them anyway. There will be a power switch for the those circuits and to power the coil. What is another switch to turn on a pump? Battery Charger will keep battery supplied at 2 amps during test. 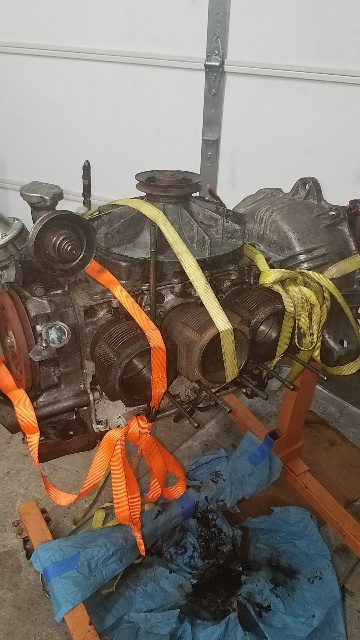 When you get this engine all buttoned back together your going to stick it in what?